Brace yourselves, Amazon Go is here !!! This is a revolution, or is it ? Yesterday I was told about a revolutionary shop that Amazon will open in Seattle, Amazon Go. I love seeing innovations popping out in this world where it is harder to be amazed. This piece of news, despite interrupting me in the middle of some non-negligible amount of work, made me happy. As a developer, the less I deal with people, the happier I am. It does not make me asocial, it keeps me sane on the contrary. Obviously we need to have a certain balance but this is not the place for that kind of discussion. The main thing that made me happy despite that shop opening on another continent is in relation to a past event. If you are an attentive reader of this blog this should remind you from a certain hackathon a couple months ago. I loved being part of it, the few days before discussing about the topic trying to figure out what we should build. The brainstorms listing out what we hate and what we love in retail. All the ideas that came out of it. Even the harder bits where we had to weed out ideas to be able to focus on only one. One we could actually build in twenty-four hours. One idea to impress the judges, one idea to conquer them all. One idea was above others, we hate waiting. This is how it occurred to us. Scanning items using your phone, finding items within a store and checking out by walking out the store. Sounds familiar does it not ? Yes, Amazon Go in a nutshell some would say. Obviously it is ludicrous to even think they would have inspired from us since presenting this idea was not worth of a podium. However, today we see it launched by a giant. In spite of not getting any recognition at this hackathon there is some comfort in seeing the world acknowledge that idea we had too as groundbreaking. We knew it back then, we know it now. It took us a night to implement a proof of that concept using an iOS app, beacons and GPS tech. From the ad I know they used much more than that for their test run. But then they are Amazon. They are giants, and it feels damn good to wake up, being confirmed that your mind is close to giants. It feels good to see it out before those ideas that beat us in a hackathon, that we may never hear about again. When we presented that mobile self checkout idea we thought it was the future, god knows I shouted it everywhere. As I said first, I am happy to see Amazon Go out there and hope it will be successful and spread all around the world. I am looking forward to a world where you remove friction that can be generated by depending by how fast your cashier or other customers are. I am looking forward to take full control of my time when I pop in a shop to buy groceries. For those that have not seen it yet here is the ad they posted. 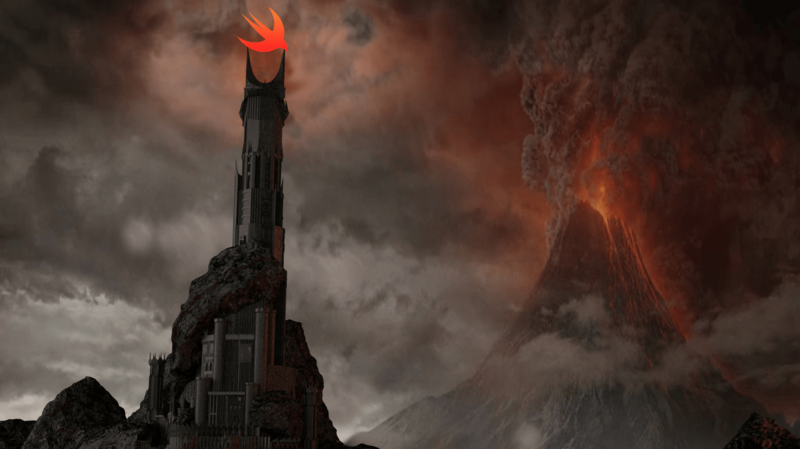 Swift: One language to rule them all ? Swift, a language to rule them all ? Two years ago at the WWDC, Apple introduced to the world a new programming language: Swift. Bringing to life a new programming language is always a challenge because even if it is the most beautiful syntactically, the lack of use cases may make it only a nice-to-have in some developers mind. Apple announced to be the future of iOS and OS X apps, which is quite bold since not all developers may learn especially with the expansion of the cross-platform app development using the likes of Xamarin or Titanium. However, bringing an open-source language allows the community to port it to multiple platforms allowing the benefits of Java without the need of a JVM to run it. I even found out that you can now do scripting using Swift which opens a lots of doors even in terms of DevOps. However what drew my attention to Swift at first is that summit that occurred a few months ago between Google, Facebook and Uber in London were discussing the language with the possibility of it getting a grown interest in each party. Add another powerhouse like IBM massively supporting and you get what smells like an IETF meeting for a new norm. Facebook and Uber are both companies trying to use cutting-edge technologies to get the best services possible for their users and are known to use variety of platforms/languages. About Google I can not really say as I do not have a direct input about it, however based on what I read in “How Google test software” it seems they are in a similar position. Then comes the big IF, what if Google was to drop Java for Android development in favour of Swift ? It might seem unlikely considering the massive following and use of Android in the developers community along with the fact that Java not only is one of the most used languages in the world but also learn in pretty much any computer science related-school. However Google may have £8.8 billion reasons to make the big jump, those sum up in one word: Oracle. Oracles, always bringers of bad news in Antic Greece but here it is not about them. It is about the Oracle that acquired Sun Microsystems in January 2010, the same Oracle which is now suing Google only to cash in on their investment. Some even speculate that Oracle purchased Sun only so they can sue Google on the conditions of use of Java, even thought I have not made myself an opinion on the matter it is quite intriguing that the beginning of “Oracle VS Google” case was only 7 months after the acquisition. With this lawsuit hanging over Google’s Android SDK, Swift is more than a valuable option. Along with the fact it is clearly Open-source, it can draw the iOS developers community to port their apps to Android without the heavy refactoring nor the code converters that are not always on point and may not follow the latest updates of this new language that is now on the verge of publishing its third version in two years. If Google was to make Swift slowly replace Java as the “First class” language for Android development that would not be before a couple of years. But at least if you read it here first and that it turns out to be true, you can still say that you saw it here first and talk about that oracle guy able to predict the future tech trends. Now imagine a world where you can build Android, iOS and OS X apps with only one language. Add the fact that this language can be compiled on UNIX systems and now even on Microsoft systems thanks to initiatives like Silver for Windows development using the .NET and Windows Phone APIs or Perfect allowing to build easily RESTful server applications. The possibilities are limitless, desktop clients, servers, scripts. You can do so much, so if you were looking to learn a new language, you know what to pick next: Swift. It’s been a while I did not post here and I was pretty busy at Lodgeo to bring you a major update that will come within the next weeks, but today is not about my company but about something new I want to try. I’m creating this “Tech around me” category as there is a lot of tech oriented activities and startup around me that are not necessarily in the spotlight yet so I decided I would do sometimes a post about things that I saw and tested near to me. This post is about CTRLio, a webapp that enables you to get the lowest rates on the market for your phone contract based on your current consumption. You can either use their interface to sign in your mobile provider account and get your actual consumption or you can enter estimations so their tool gets you the plan that fits you the best. The user experience is straightforward you instantly know where to click and within a few seconds you get to know a cheaper plan. Another interesting feature is that you can also get reminders for when your plan will expire so you can fully enjoy this experience. You can find out more on their website: https://ctrlio.com .